Reading this book, one wonders what would have happened if someone other than Göring, a drug addict, slacker, looter and idiot, commanded the Luftwaffe? Irving's well researched book traces Goring's life from his childhood in Bavaria through his education at a military academy where he first fell in love with smartly trimmed uniforms, through his experience as a Fighter Pilot in W.W.I, then through his early connection with Hitler and what Hitler stood for in the years of humiliation and finally, to the years of power as Hitler's second in command. Irving leaves no doubt that Goring was a monster, a monster who had no second thoughts about engineering the deaths of countless numbers of innocent people. He found it aesthetically unpleasing, however, to actually witness any of these "unpleasantries." 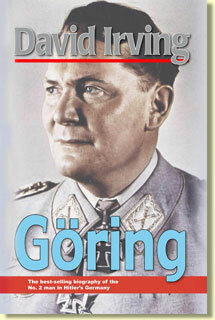 Goring was a coward who pretended to be brave and heroic. He was a morphine addict because he couldn't tolerate pain, but had no qualms about inflicting pain on others. He was honest to no one, not to himself, not to his fellow officers, and certainly not to Hitler. A great percentage of his energy during the war years went to fabricating alibis and hiding from Hitler so he wouldn't have to admit to his responsibility for many great failures, particularly where the Luftwaffe was concerned. All in all, a gem of a book and as usual, in Irving's meticulously high standards. Read it together with Irving's biography of Milch, and you get a feel of the real Luftwaffe.